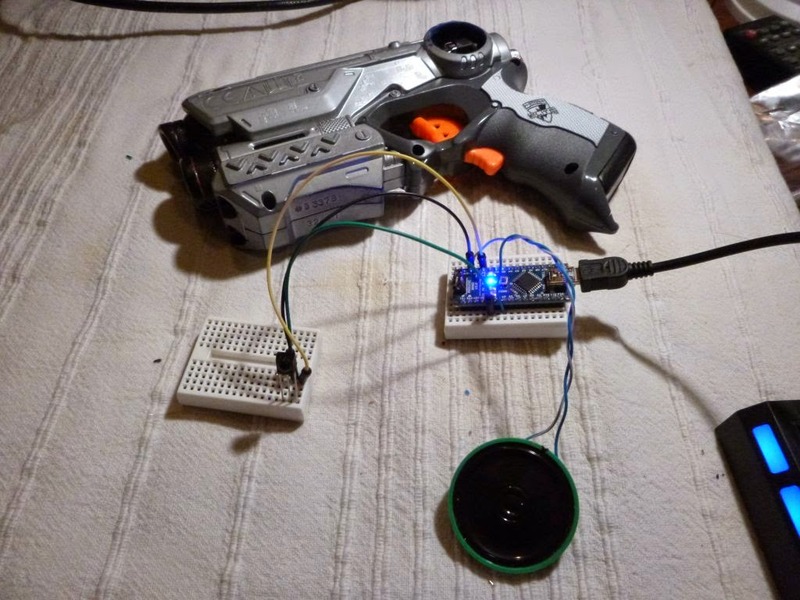 The flipside of making my own Laser-Tag gun is I also want to make my own sensors. Phil Higgins makes a sensor designed to be worn on the head which is accepted to reliably take hits outdoors and has all the 'data over tag' stuff coded in by him already. Loads of people in the group I play with use these and I can't see myself replacing mine with something of my own devising. However I do want to make a 'target' for testing Laser-Tag guns against and maybe some props that can be shot as part of broader functionality. So tonight I messed about with a simple test rig of an IR detector wired up to an Arduino with an Interrupt Service Routine attached to the relevant pin. Laser-Tag uses a 56Khz carrier signal which is slightly different from typical IR remote controls, but there's a recommended component for putting in the sensors: a Vishay TSOP34156. This filters out the carrier signal and background noise from ambient light, leaving you with a microcontroller compatible output of just the encoded signal. So far so simple, I now have a simple sketch that will flash a light and play a tone when I shoot the sensor. It's not really matching the Laser-Tag signal, just counting pulses and registering a hit if it gets enough in a short period. One of my remote controls sets it off. This is something I can work on. For now though, tonight's fiddling has shown me that building a target shouldn't be hard. So I can start making the case etc. and then hone the code once it's in a usable shape.